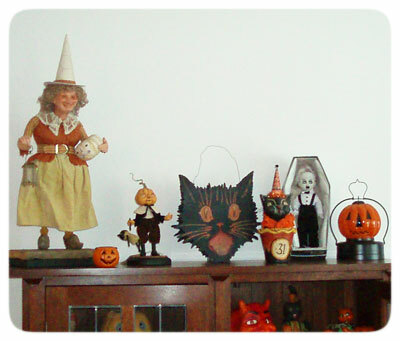 K: I bought a Scott Smith item at a gift shop and stumbled across his Halloween and Vine website, saw your collection and had to have some. When I attended H&V last year I had a whole game plan. My plan was to dart to your table fist, place my orders and then dash to Scott's & Greg's and then place an order and see what was left. J: How long have you been collecting my originals? K: Only about 2 or 3 years. J: What is it about my creations that captures your imagination? K: They are so unique, and the fact they are each hand made. I love originals! 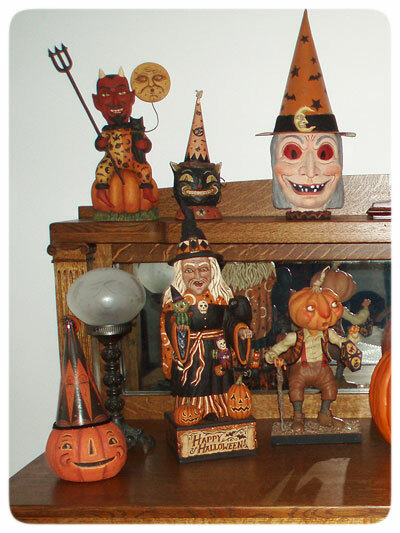 J: Where have you had the best luck in acquiring my original pieces; shows, web sales, Collector's Catch, eBay, etc? 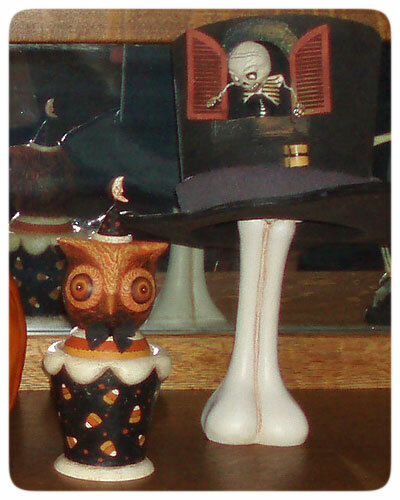 * Another one of my one of a kind owl candy containers shares a spot next to a whimsical Scott Smith skelly top-hat creation. 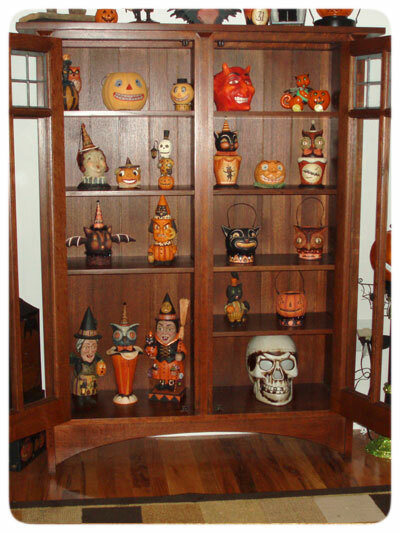 J: Do you have a favorite piece in your private collection? K: Hmmm, tough questions. I wouldn't part with any but I'm fond of the owl you made me. 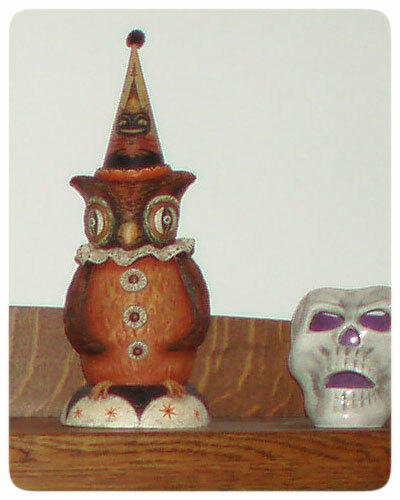 * Yet another one a kind owl from my studio to Kevin's house. I wonder if this is the owl he's referring to? He has quite a few! 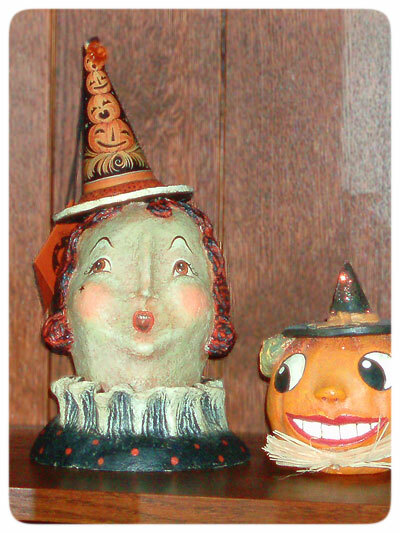 K: Witches, maybe a Dracula or Frankenstein. 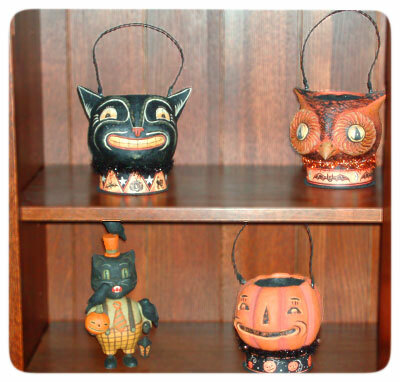 * Back to the curio cabinet, Kevin has a trio of my Halloween buckets designed for Bethany Lowe Designs intermixed with a black cat from Greg Guedel. 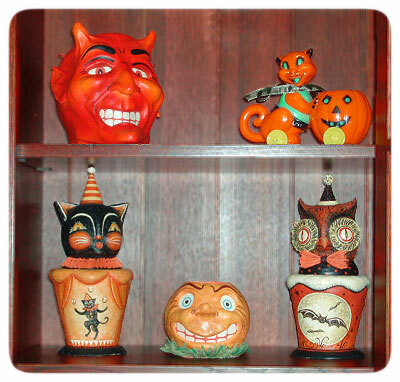 *A variety of collectible Halloween folk art pieces resides on Kevin's antique buffet as well...Left to right: Johanna Parker reproduction JOL from Primitives by Kathy, Greg Guedel devil & witch, Johanna Parker reproduction black cat from Primitives by Kathy, Katherine Webber witch & Scott Smith JOL man. OH to be in such great company!! What fun! 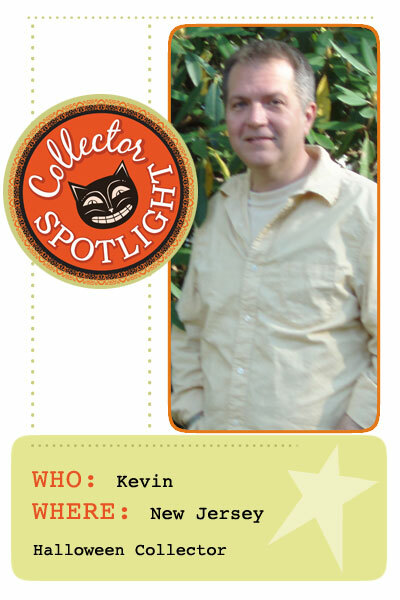 Many thanks Kevin for allowing us to peek inside your new home to see how you decorate for the haunting season. 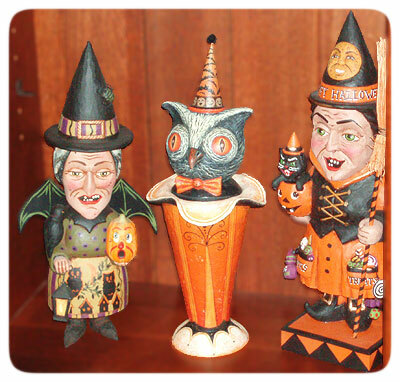 We look forward to seeing more from you in the future, and I very much appreciate your love for my Halloween folk art as do the other artists that you represent in your collection. If I left anyone out, please let me know and I will offer you credit.